With the Tony Awards around the corner, the voters we really wanted to hear from were you! And not just about the awards, but about your theater life in general; from how you like to get to the theater, to the intermission snacks you enjoy (or don’t…), to your outfit of choice. It might be the 70th Annual Tony Awards, but with a history making 16 nominations, many have aptly named this year the #HamilTonys. When Tony nominations were announced we saw an astounding 220% increase in Hamilton ticket alerts alone! The majority of of theatergoers polled (77%) have tried to secure tickets to Hamilton on Broadway, but only half (50%) have been successful. Of those who couldn’t snag a ticket, a quarter (25.3%) have attempted over 50+ times! It’s no surprise that Hamilton is as exclusive as it is celebrated. But for those of you who haven’t been able to see the musical phenom, we wanted to know who you thought should win this year. Sugar, butter, flour, the ingredients for a great musical. When polled on your picks across six musical categories, Waitress emerged as a clear fan favorite. American Psycho and Shuffle Along were also big winners. But Hamilton does exist (and will most likely win many awards this year.) So we wanted to give props to the under appreciated aspects of the theater that don’t get recognized at the Tonys. Fridays, Saturdays and Sundays are so 2015. 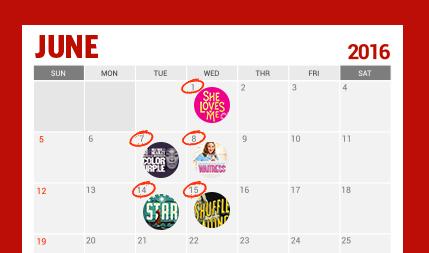 Tuesday and Wednesday days are your preferred nights to see a Tony Award nominated show. “Have to make a decision.” More than half of people polled said Tony Award nominations help them decide which show to see. The Playbill is your snap of choice. 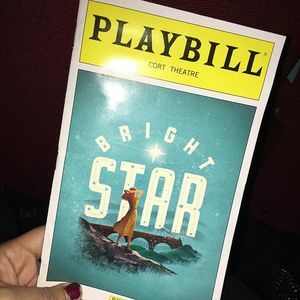 53.5% of theatergoers prefer the Playbill to the marquee for showing off the evening’s entertainment to your followers. Aside from the show itself, the majority of theatergoers enjoy the Overture the most. Though, 17-24 year olds are the most likely to say that their favorite part of the theatre experience is waiting outside the stage door #fangirls. The golden days of theatrical formality have passed. Most theatergoers (63%) dress business casual for a night at the theater, while a quarter (26.1%) dress very casual. #WhatWouldAnaDo? In addition to nixing the formal wear and saving money on dry cleaning bills, an overwhelming majority (70.3%) refrain from indulging in beverages, citing that concessions are too expensive. And most (62.1%) take the subway to their performances. To no-one’s surprise cellophane is the bane of theater goers. 68% of theatergoers name chips as the most annoying intermission snack you’ve heard, while 5% cursed anything that needs to be unwrapped, especially hard candies. Silence is still golden – except for on stage. 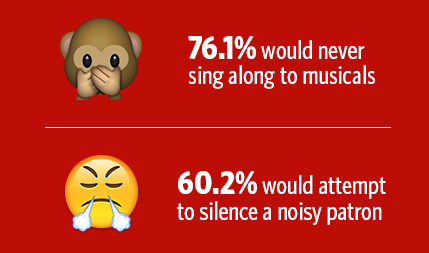 An overwhelming majority (76.1%) would never sing along to musicals, even their favorites, and most (60.2%) would attempt to silence a noisy patron by giving them a glare or two. Patti would not be pleased. What kind of theatergoing experience would it be without a ringing cellphone? We have to call out the one person who admitted to being a theatertalker (“I’m usually the one talking”). If you ever encounter Patti LuPone, we wish you the best of luck.